I have vivid memories of eating Chicken Cordon Bleu as a child. VIVID ones. Let’s just say that my mom was not a fan of cooking. The “I love cooking” gene skipped a generation from my grandma to me. She fed us kids alot alot alot of frozen chicken cordon bleus. I liked them. But I like this pasta better. I love this pasta, in fact. 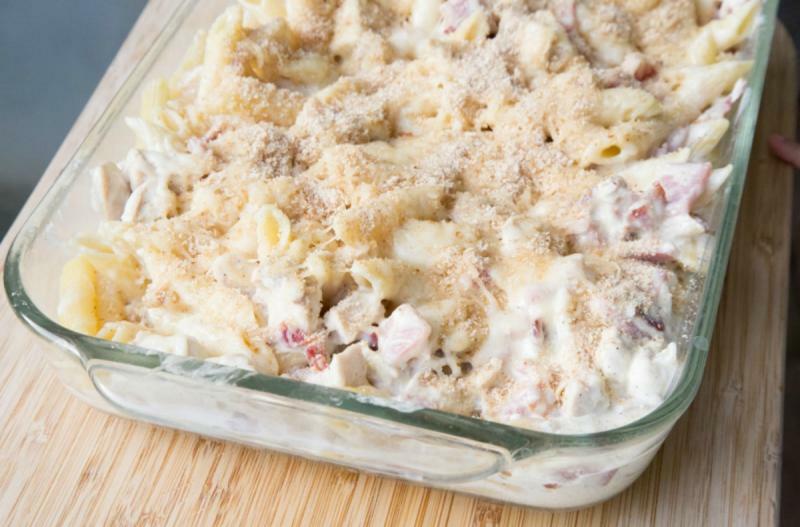 It’s so rich and creamy...and is filling and delicious...and serves a crowd! I love having this one on hand for our family, or when we have guests over for a meal. Enjoy! Cook the pasta, as directed. Drain and add to 9x13-inch baking dish. In a small bowl, toss the shredded rotisserie chicken, diced ham and chopped bacon. In a small skillet, warm the heavy cream over low heat. 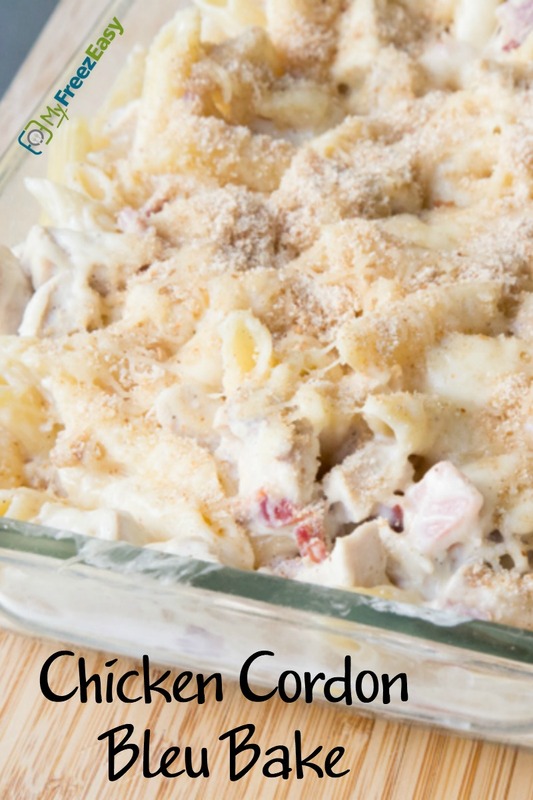 Stir in the cream cheese until it melts and then stir in half of the shredded Swiss cheese. Once the sauce is smooth and creamy, stir in the chicken-ham-bacon combo. Then pour into the baking dish and gently toss with the pasta. Add the remaining shredded Swiss cheese on top, then sprinkle the garlic and onion powder on top, and finish with the bread crumbs on top. Bake in the preheated oven for 15 minutes, or until warmed through and cheese has melted. Serve Chicken Cordon Bleu Bake with salad. Cook 2 boxes of pasta, al dente. Drain and add to tray. In a small bowl, toss 6 cups shredded rotisserie chicken, 2 cups diced ham and 2 cups chopped bacon. In a small skillet, warm 4 cups heavy cream over low heat. Stir in 16 oz. of cream cheese until it melts and then stir in half of the shredded Swiss cheese (amount varies by serving size - check recipe). Once the sauce is smooth and creamy, stir in the chicken-ham-bacon combo. Put baggie in the freezer and freeze up to 6 months in fridge freezer or 12 months in a deep freezer. Thaw in the fridge overnight, or a warm bowl of water for about 20 minutes, before transferring to the oven and baking as directed. Thaw and bake at 3500 F for 15 minutes, or until warmed through and cheese has melted.